After drying for a month, the wood is finally ready to be processed. 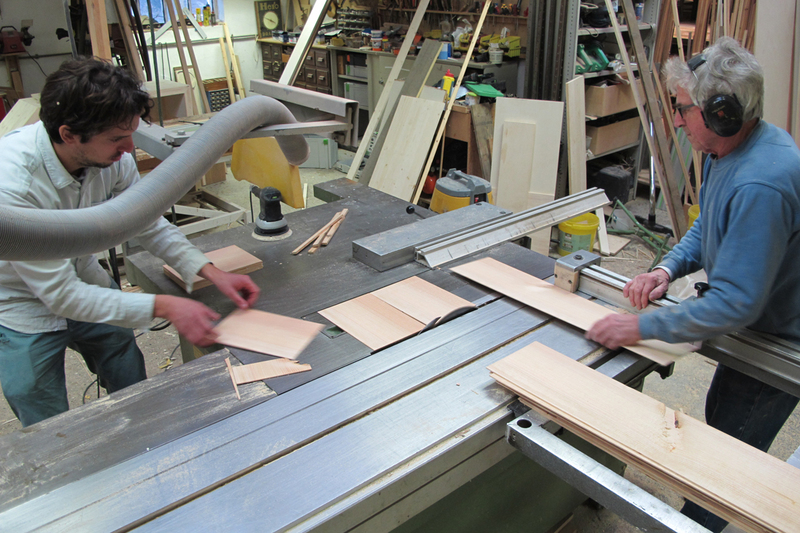 To do so, we visited furniture maker Theo van den Bergh, who stored the wood at his workplace for the last two weeks. Adjusting the thickness of the wood to the different types of objects. Straightening the wood before sawing it in the right proportions. Sawing the wood in the right dimensions for all five Diptych products. Sawing the wood in the right dimensions. 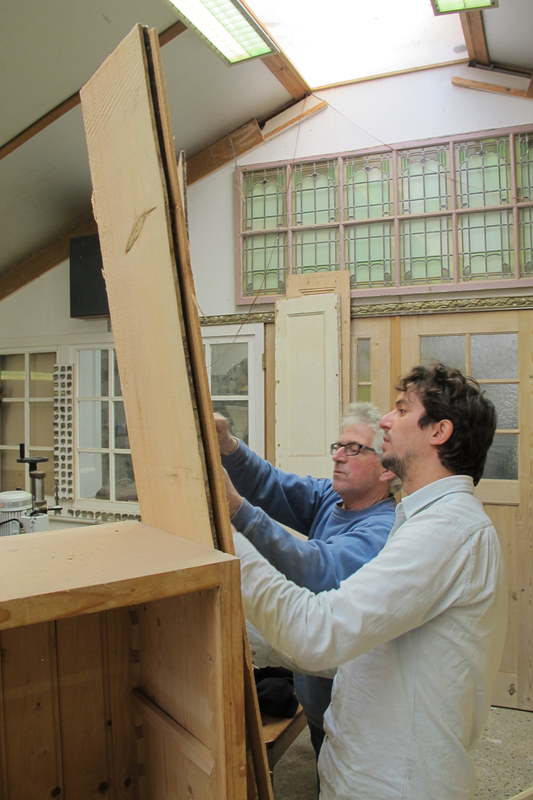 The wood of the original Douglas fir is to be divided over five types of objects that will form the Diptych series. 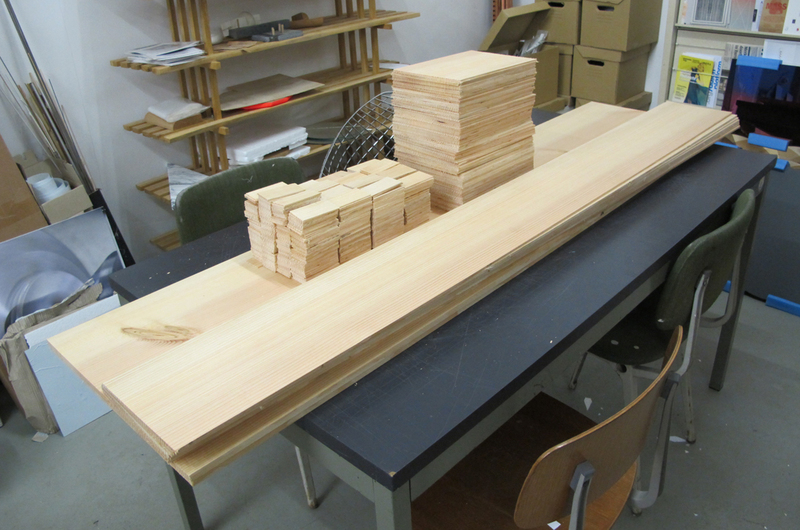 After smoothening the surface, the slats are sawn in the right proportions, corresponding to the different products. Since every object is to be sandblasted, it is very important the wood does not have any knots. A knot marks the spot where a branch was located, so most trees contain quite many. Useful pieces are therefore scarce, especially for the larger products. Theo made sure to get the most out of it. All the wood for the first batch of five Diptych products. We’ve already revealed two of the final five products to you: a poster and combs. Today we unveil the third one, a totem. This long, patterned object is meant to hang on the wall. All three products will be presented at Object Rotterdam from 6 till 9 February. This design fair is located in the impressive new building ‘De Rotterdam’ by Dutch architect Rem Koolhaas and his bureau OMA. We’re looking forward to seeing you there.